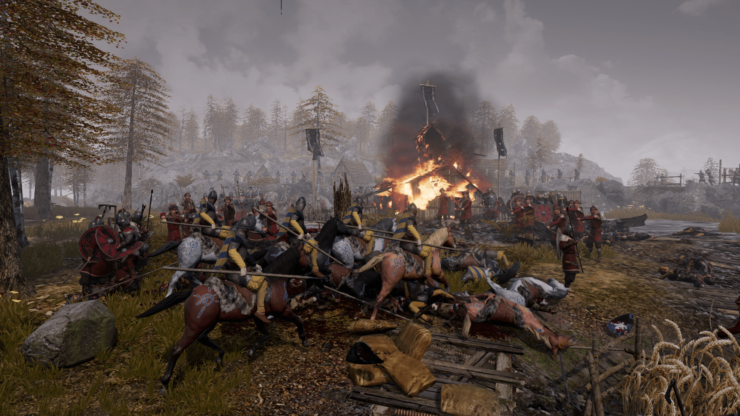 With Relic Entertainment now busy working on Age of Empires IV, RTS fans looking for an experience akin to Company of Heroes might do well to keep an eye on Ancestors Legacy. Developed by Polish studio Destructive Creations, the game is due to launch on May 22 for PC and Xbox One (running at native 4K on the Xbox One X). PC gamers are now able to test it thanks to the newly released multiplayer Open Beta test via Steam. We’ve interviewed Producer Tomek Gop, who has previously worked for the likes of CD Projekt RED, CI Games and Techland, to bring you more information about this promising RTS. Enjoy! There’s this stigma that real-time strategy games have to be somehow downgraded whenever they have to support gamepads as well as mouse and keyboard. How do you plan to overcome this issue in Ancestors Legacy? We’ve worked on gamepad controls from the very beginning of the project, so the number of iterations we’ve put into making it, efficient is significant. Next thing, there are basic things in all RTS that players are used to doing… their own ways. It’s always been like this on PC. So we wanted to do the same on the gamepad. For example selecting troops, navigating between them – there are multiple ways to do that using a controller. So far you have jumped between games and even genres (Hatred, IS Defense, now Ancestors Legacy). Should Ancestors Legacy be successful enough, will you create a sequel (possibly in another time period)? It’s not impossible. Just too early for a studio like us to make declarations now – with our size, budget and headcount, we usually make decisions like this based on how the project does upon release. It’s been the same with Hatred. We live in a harsh reality, I mean, harsh for devs – with so many games being released. It will take us some time to reach a point where talking about a project as big as Ancestors Legacy won’t be enough. Where we will feel confident enough to talk about the next one, and even the one after that. It’s not like we don’t have plans. It’s just they are… plans for now. options combining the use of terrain, experience and morale)? advancements, and so on. Use of terrain allows players to hide in the bushes for a surprise advantage, use ranged squads to deal damage before the enemy even gets to them, hiding from arrows in the rain, or from cavalry charge in the forest… Experience and morale are simply stats that add up to attack effectiveness and its damage. For example, starving soldiers lose all their morale and thus are close to useless in battle. Do you have an estimate on the length of the single player campaign? There will be a total of 40 missions in the story-driven part of the game (two five-mission campaigns per each nation). We might not be able to implement all of them on a release date. But I want to be clear about one thing: even if we release, say, 30 missions at launch, the remaining 10 will be free, as an update close to release. Now, all those 40 missions should take anywhere from 30 to 40 (maybe 50?) hours of gameplay, depending on the RTS experience. Do you plan to add more nations post-release via DLC/expansions? We’d like to, but that’s as much as I can say right now. Have you considered crossplay between PC and Xbox One? Another real-time strategy game, Halo Wars 2, recently enabled it. Windows Store, players who buy the game there will most probably be able to cross-play. Will you organize a beta for Xbox One? Also, will the game release on Microsoft’s console day and date with the PC version? both sides really want to do it. And regarding the release – yes, Ancestors Legacy launches May 22nd on both platforms – PC and XBOX One (One X) too. Will there be any changes on consoles at all, for example in terms of units on screen, compared to PC? Not planned as of now. Cheers to our tech team! Will Ancestors: Legacy be enhanced for the Xbox One X? If so, can you share the technical specifications with us (target resolution, frame rate, etc.)? South in January. It’s not like we’re reinventing the wheel here, but to put it simple: folks who own an Xbox One X will have either higher framerate, more details, or higher resolution. Or all at once, but probably my tech team would kill me for declaring this! Why did you choose to launch the game on Xbox One rather than, for example, on PlayStation 4? What are the odds to see Ancestors Legacy on PS4 in the future? It’s almost too ambitious for our 25-people team to create a game on two platforms simultaneously. Once we decided we’ll go for it anyways, all the research we’ve done told us that it’s easier to do PC & Xbox One rather than, say, PC & PlayStation 4. And since the game is being created on PCs anyways, there was no other option to consider (yeah, yeah… I love Switch too, but the project started 2,5 years ago). Are there any plans to add modding support? We’d love to. We did it with HATRED, so why not? Just Ancestors Legacy is so much bigger of a game, so give us some time. And (hopefully!) please let the love for our game grow first.